Laser Therapy, also known as Class IV Laser Therapy, is a treatment that utilizes specific wavelengths of light to interact with tissue and is known to accelerate the healing process of a variety of clinical conditions. 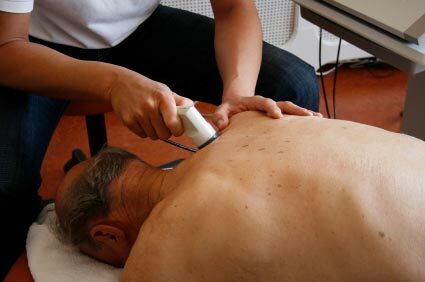 By definition, this type of therapy uses radiation intensities that induce minimal temperature elevation (not more than 0.1 to 0.5 degrees celsius), if any. Low­-energy lasers have been promoted as an effective way to produce pain relief. Class IV lasers are handheld devices used by the doctor and are typically the size of a flashlight. The laser is placed directly over the injured area for 30 seconds to several minutes, depending on the size of the area being treated and the dose provided by the laser unit. Class IV laser therapy is one option among a variety of treatment approaches that can potentially alleviate pain symptoms without the use of surgery or drugs.